One of the things it's really not necessary to have on the wargames table, but which I want to have anyway, are aircraft models. A case might be made for including models of dive-bombers and other ground-attack aircraft, but having models of strategic bombers cluttering the place up is really pretty pointless. That, naturally, has not stopped me. I found this model of a He 111 on Thingiverse, at http://www.thingiverse.com/thing:3317489 by someone called T1ckL35. 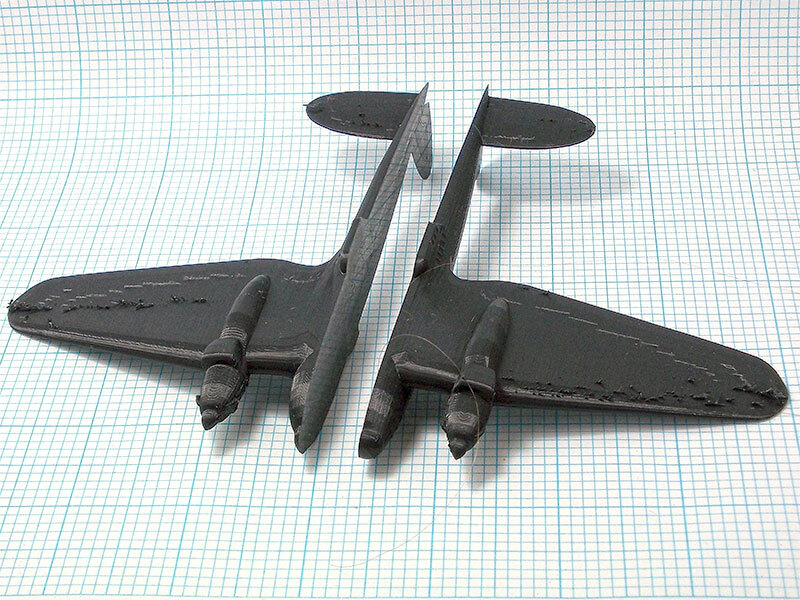 The model is produced at 1/200 scale, and I've re-scaled it to 1/144 to fit with my fighter models. 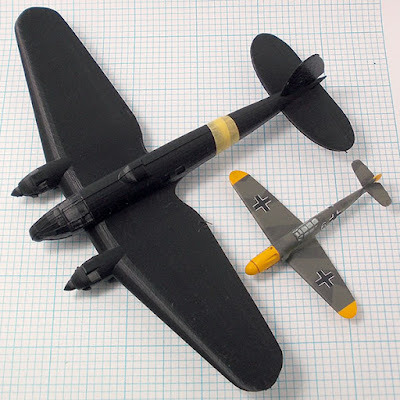 The Heinkel 111 wasn't particularly large as far as WWII bombers went, but it's a monster compared with my 1/144 fighter models, most of which are by Zvezda, as is this Me 109 F.
Zvezda do their wargaming aircraft in two scales: 1/144 for fighters, small fighter-bombers and the like, and 1/200 for bombers. 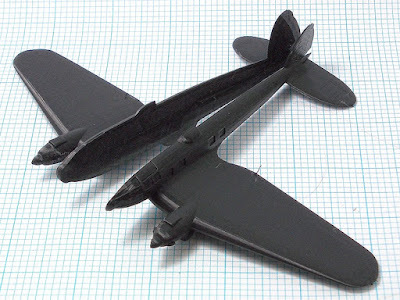 That leads to some odd anomalies in sizing: for example, their 1/144 Fairey Battle is quite a bit larger than their 1/200 Bristol Blenheim. I prefer to have all my models in a constant scale if at all possible, but I can certainly understand their rationale for the decision. The model prints in two pieces, split along its vertical axis. There are no locating pins or sockets, so some care will be needed to make sure that it glues together squarely. I've found that by squeezing the front and back of the tail fin between finger and thumb of one hand, and top and bottom of the fuselage between fingers and thumb of the other, I can get a pretty reliable alignment of the two halves. Because I have a glass platen on my 3d printer, the matching surfaces are perfectly smooth, which is ideal for getting the strongest possible bond with cyanoacrylate glues. I will need to be using one with a little bit of working time though, just to make absolutely sure I have everything perfectly aligned before the glue goes off. The two halves are arranged with their ventral surfaces facing each other on the printer platen, which is good — that means that any printing travel artifacts are on the ventral surfaces, which will generally not be particularly visible. The whole thing will need a bit of sanding to smooth it off in any case, but this will minimise the amount of work I will have to do on the visible dorsal surfaces. 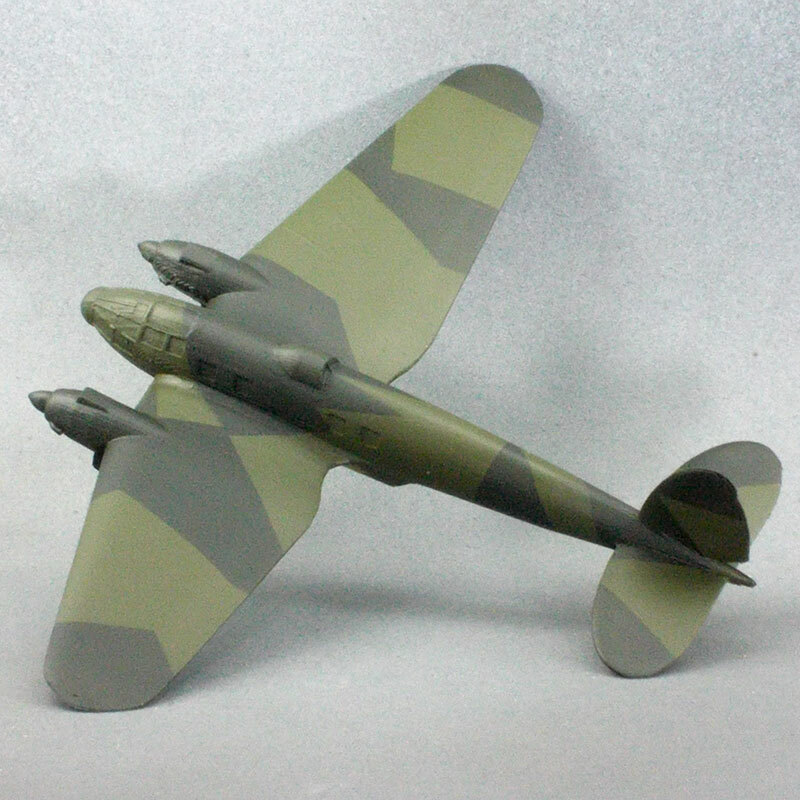 I've got it assembled and airbrushed with its basic splinter camouflage scheme. I'm not at all familiar with Luftwaffe colours so I've just found some pictures on the internet and used a couple that look OK together to me: VMA 71011 Tank Green and VMA 71013 Yellow Olive. I'm even less sure about the undersides, but I think a generic pale grey-blue will do the trick. I will have to draw on the panel lines, and for that I'll see if I can find some fine waterproof medium-grey and light-grey fibre-tip technical pens. I could use black at a pinch, but that can look a bit cartoonish. 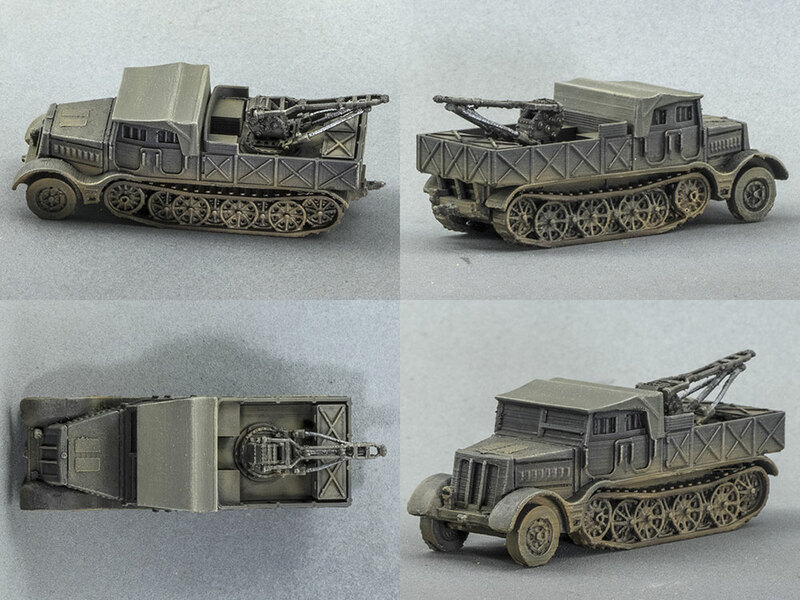 This is the 1942 Raupenschlepper Ost, a fully tracked truck developed for use in the mud and snows of Russia by the Germans in WWII. A great many were made, and they were very popular little vehicles. The model is based on a 1/200 scale version by m_bergman, which was re-scaled to 1/100 and cut up into pieces by krueger54, so that it would print without supports. I took krueger54's version and made new running gear for it, and also a new hollow canvas tilt. The tilt piece just slots into the cargo bed, so it can be swapped out for different cargo loads, or I could print another tilt and paint it as an ambulance vehicle, for example. Maximum flexibility! Or else it could just be glued in place. Whatever. A six-foot (1800mm) man at 1/56 would be 32mm tall. At 1/48 scale, he should be 37.5mm tall. A 28mm 6-footer would be more like 1/64 scale. A 1/72 scale 6-foot gent should actually be 25mm tall, so at least there's _one_ of the popular scales that is what it says on the tin. 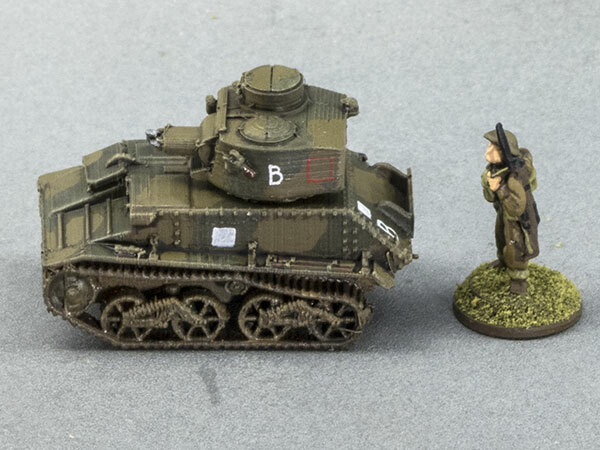 A 20mm figure scales out to 1/90 scale. At 1/100 scale, 6-foot men should be 18mm tall. 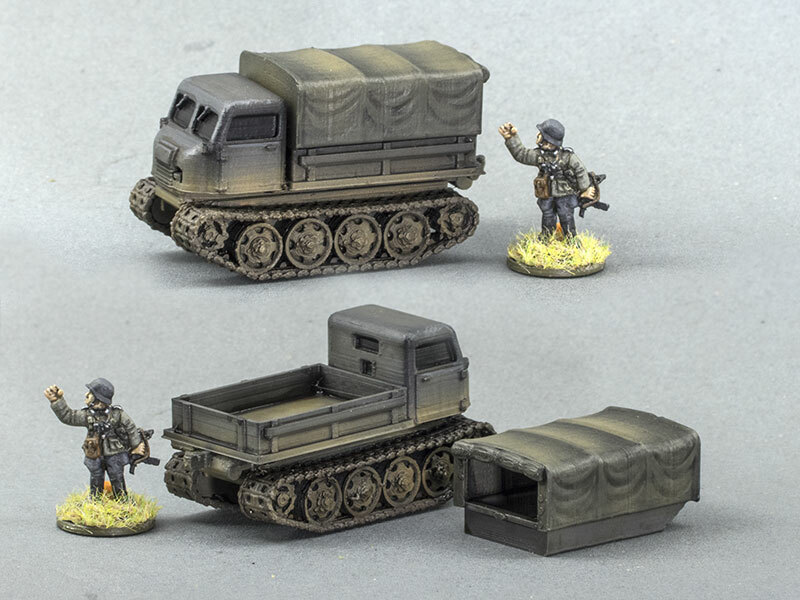 A genuine 15mm tall figure scales to 1/120 scale. 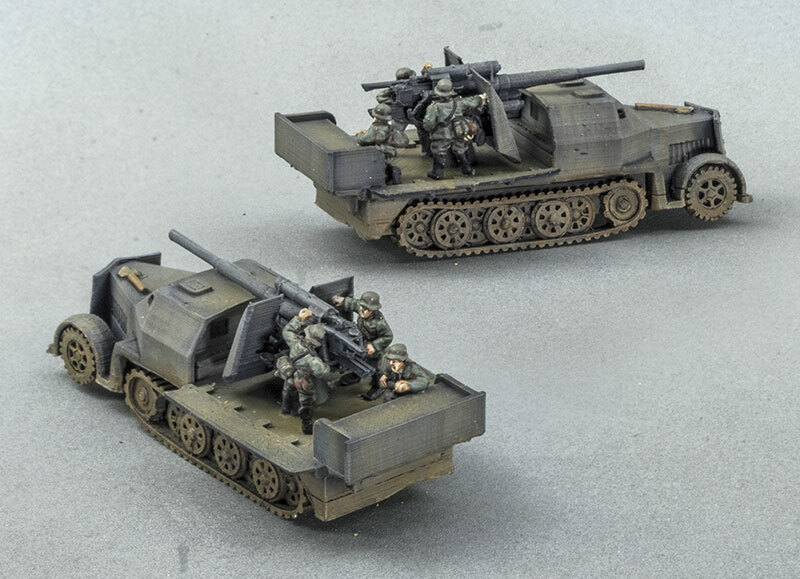 All this is all very well, though it's not going to make one jot of difference to the people who are heavily invested in their "20mm" 1/72 scale wargames forces. a figure is measured from the sole of its feet to the top of its head, ignoring any headgear. The effect is that different manufacturers create figures of quite different heights from those of other manufacturers, and market them under the same supposed millimetre size. It's all a complete shambles, and I think the idea of describing figures by some arbitrary and highly mobile mm-size is an absolutely terrible one. 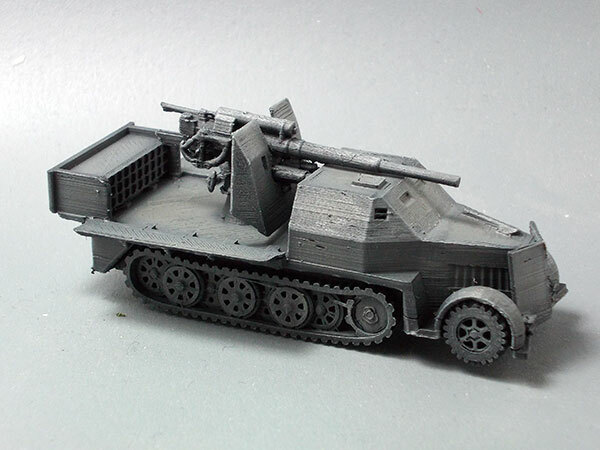 Here it is, fresh off the print bed, my shiny new 1:100 scale 18-tonne SdKfz 9 FAMO. It's a bit of a layer cake; I ran out of grey filament and had to swap to black part of the way through. I've included the Zvezda King Tiger in the background for scale; the Famo is stupidly large. Large enough to comfortably throw a sIG33 in the boot with room to spare. I think it will end up being my repair/recovery vehicle; I might just design a crane/winch module to slot into the cargo bed. The two-colour scheme reminds me of the Matchbox kits of yore, that were manufactured in two different colours of plastic for no very good reason. I designed this crane module to slip into the cargo bay. The actual recovery vehicle wouldn't have had any sides, but adding this will at least make it look a bit more recoveryish. I haven't printed it yet, except for the floor piece to ensure that it would fit snugly in place, and I think it might be a bit of a tricky print. Here it is, in place in the cargo bay of the FAMO. FDM is not the ideal medium to be printing this sort of thing in, a DLP or SLA resin printer would give much cleaner results. 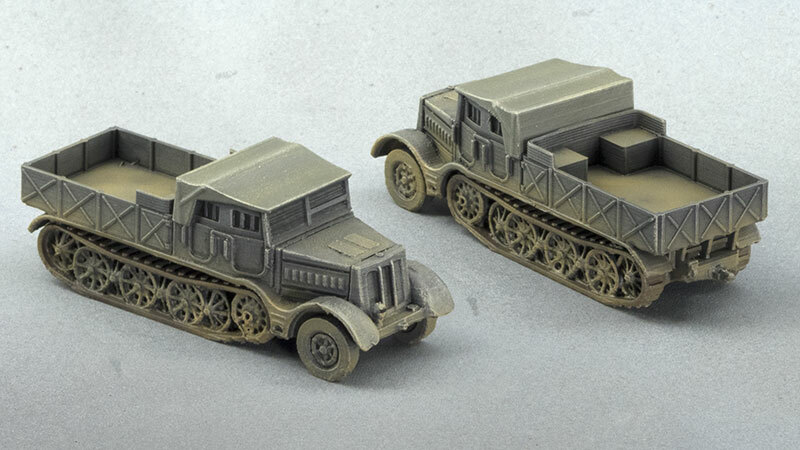 However, this will do for the purpose, which is to identify it as a recovery vehicle on the wargames table. I printed this model to test Cura 3.6's concentric top shell slicing, with very satisfactory results. It's a 1:100 scale (15mm) StuIG 33b, basically just a 150mm howitzer in a steel box on a StuG III chassis. It'll come in handy if we ever get to Stalingrad. This is a 1:100 scale SiG33b, modelled by TigerAce1945 (I think), which I sliced with Cura 3.6. I'd read that its Concentric top/bottom shells were much improved, and so I tried it out on this print, and it certainly is better than it used to be. Most importantly from my point of view is that there's no separation between the top and side shells, which I've been getting a lot with the Cura profile I've been using. 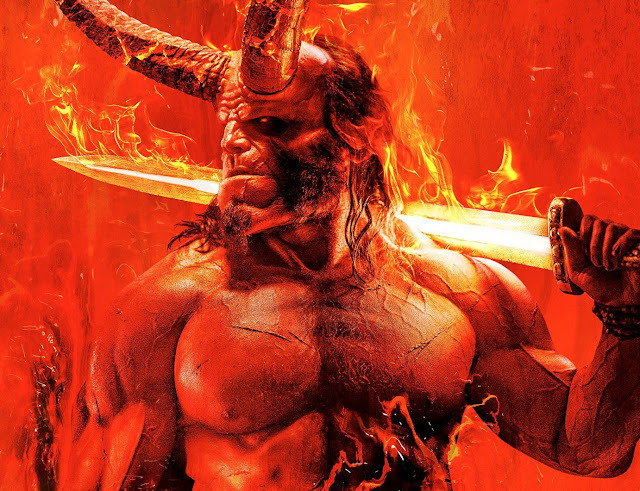 This promo image for the Hellboy reboot movie led me to think about a variant on that old D&D chestnut, the Flame Tongue magic sword. Essentially, it would have a sort of Heat Metal effect on the blade, as in the Druidic spell. The longer it is wielded by its user, the hotter the blade becomes and the more heat damage it will inflict in addition to its sharpened-metal-bar damage. The heat damage would start out in the first round as an additional d3, then 2d3 in the second round, 3d3 in the 3rd, and tops out at +4d3 heat damage thereafter. The twist (not much of a twist really) is that the heat will also gradually propagate through the grip, burning the hand of the wielder if they're not immune to that sort of damage. I'd run it on an increasing scale — say, no heat damage in the first round, then +1 point of damage per round (i.e. 1 point, then 2 points, then 3 points, an so on) until it's doing as much heat damage to its wielder as it could to a target (i.e. 12 points per round of burning). The wielder, in addition to taking the damage, would have to make a Will save at -1 per 2 points of heat damage, to not involuntarily drop the sword. The sword cools when not being held at twice the rate it heats up. 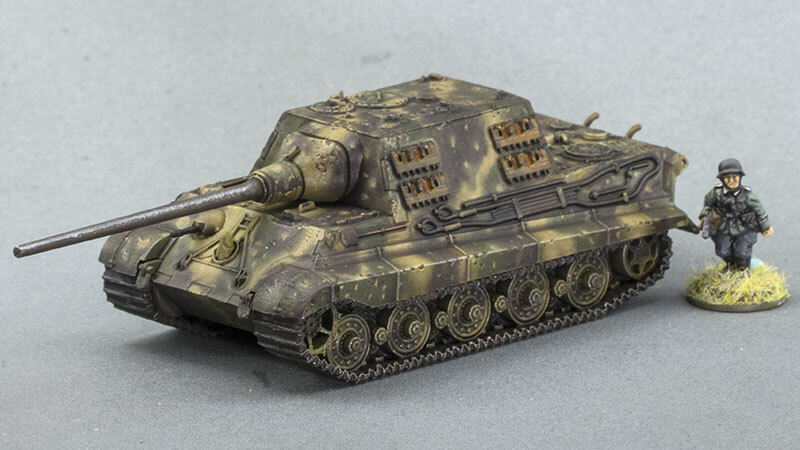 A while ago I bought myself this Zvezda 1:100 kit of the 128mm tank killer, Jagdtiger, and I just got around to assembling and painting it today. 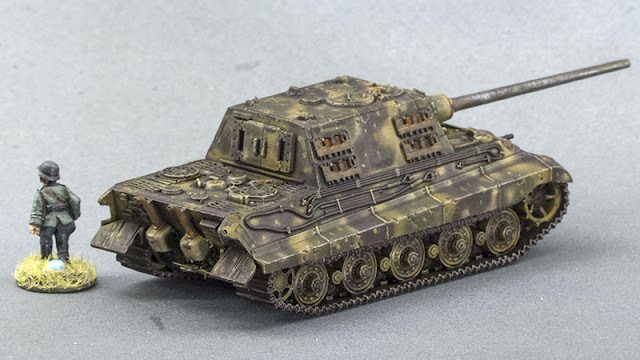 I have no immediate use for it, but I have a sentimental fondness for the vehicle from the days of my childhood, when our wargaming consisted of getting as many of the biggest and baddest tanks on to a table as we could, pretty much stacking them wheel to wheel. I would sneer at such a callow display these days, but boy, did we have fun. This was the first real outing for my Badger Sotar 20-20 airbrush, and to say that I am satisfied with it would be a profound understatement. It is by far the best airbrush I've ever used. I have a fine tip and needle set coming to me, but it may not really be necessary — even the medium set it currently has installed is excellent. 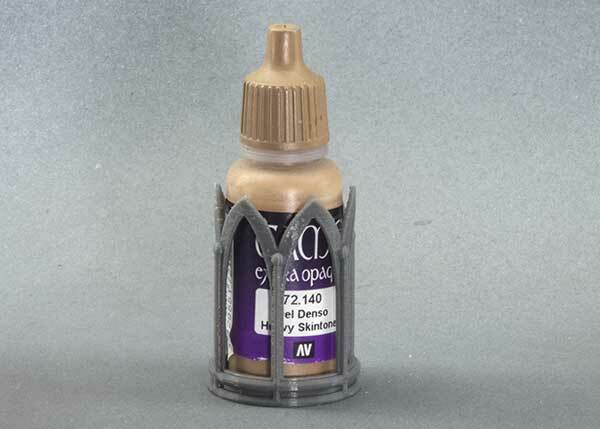 For no particular reason, I felt the need to create a pseudo-Gothic Revival Puginesque paint rack for the 17ml dropper bottles used by Vallejo, reaper and others. The STL is available on Thingiverse, it's about 15MB. Not a great model, nor a great print, but it should give those Matildas something to worry about. These things were originally intended for the German invasion of Czechoslovakia in WWII, but in the end military action was unnecessary there and they didn't see service until later. There were some — about ten, I think — used in Poland and France, and later on about fifteen in Russia. The last of them was lost in 1943. 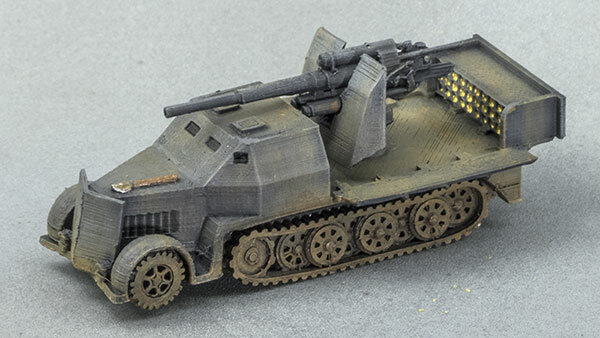 Essentially, it consists of an 88mm AA gun mounted on a heavy half track; at first, the 12-tonne SdKfz 8, and later the 18-tonne SdKfz 9 Famo. They were originally intended as bunker-busters, and they did that job extremely well in Poland. In France, their role expanded to anti-tank duties as well. The first designs didn't allow the 88mm to be used in its original anti-aircraft role, but the later ones on the 18-tonne vehicle could. 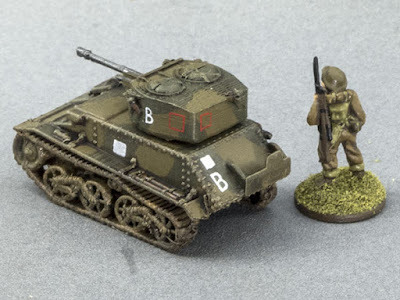 This model is supposed to be the 18-tonne version, which is a bit of a pity, as I really wanted the version that served in France in 1940 which differed in several respects. The earlier model had no drop-down sides to extend the fighting platform, and the cab was just plated over with a small cupola for the driver. However, this will do as a generic representation for the wargames table. 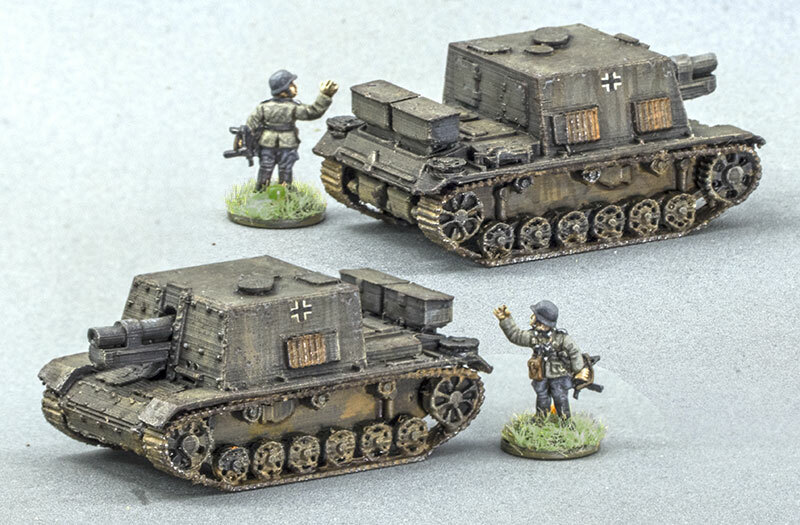 I need to get a crew for it — I have some Peter Pig 15mm German artillerymen somewhere, if I can just find them — and I need to find out what, if any, markings it should have. I found those Peter Pig artillerymen, no mean feat I can tell you, considering the appalling shambles that is my workroom. I only put three on the vehicle, far fewer than the actual crew required to operate an 88, but any more and it becomes intolerably crowded. Which it would have been, I suppose. 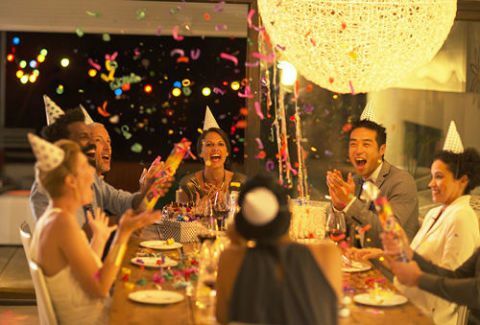 ONE THOUSAND and FORTY-FIVE POSTS! I dragged a much-depleted old(ish) reel of blue no-name PLA out of the drying cupboard yesterday, and put it on to print out a 15mm 88mm Bunkerknacker, which it did just fine(ish). What I wasn't expecting though was that it glued itself to the bed so effectively that when I came to remove it, after everything had cooled down, I had to exert so much force that the main component split right through and flew off the bed in two pieces. Fortunately the break was clean, and I could glue it back together easily enough, but the rough handling has bent a few bits here and there. Nothing too serious. I had forgotten that I hadn't needed any hairspray or anything at all to help that particular filament stay on the bed. The most common tank in the British arsenal at the beginning of WWII was the Vickers Light Tank Mk.VI, in two main variants: the VIb (pictured below), armed with one .50 and one .303 Vickers machine-gun, and the VIc (right) with a 15mm BESA and co-axial 7.92mm BESA machine-gun. Despite being the most common tank available to the BEF, I've had none at all in my wargaming force, because they are frankly pretty crap. They're bullet-proof (just), but fall to bits if confronted with anything heavier than rifle-calibre missiles, and their armament is wholly inadequate against almost any other tank, allied or enemy, they're likely to encounter in France. However, I thought in the interests of historical veracity I'd better make some, so I have, half a dozen, which should provide plenty of cheap and easy targets for the Dirty Nazis. 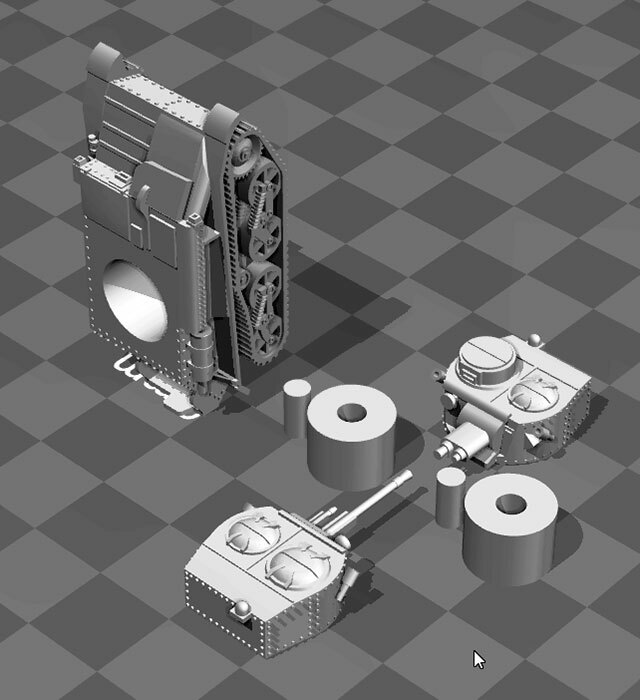 The hull for the Mk.VIb and Mk.VIc is essentially identical, so I've just printed a pair of turrets for each hull. The "B" markings for this particular model are made up, and will be different to all the others. 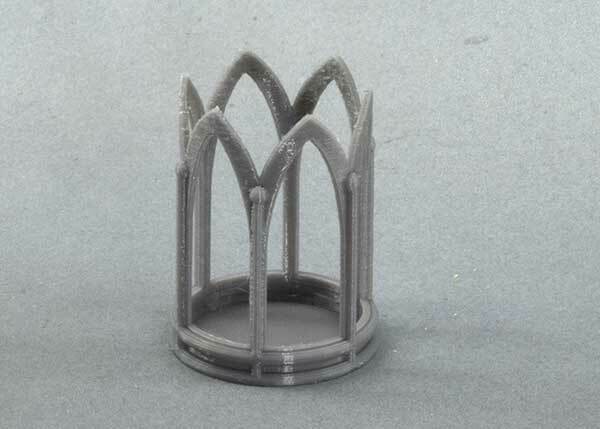 That's because this one, the first one I printed, does not have turrets interchangeable with any of the other hulls, while the others all are, and I want to be able to distinguish it at a glance. 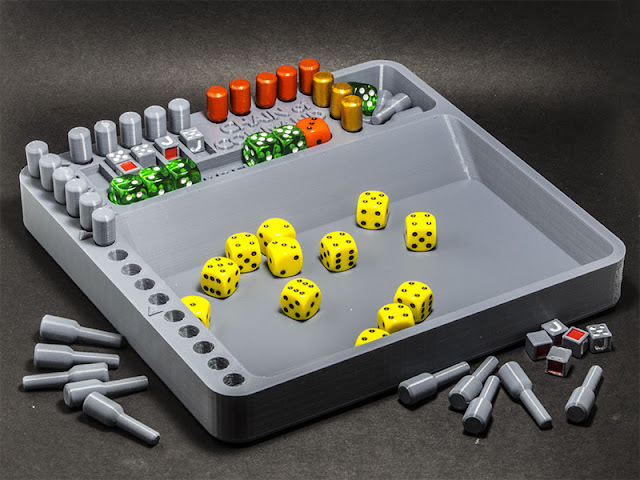 FDM (Fused Deposition Modeling) 3d printing is a marvel, and it has revolutionised the way that I make the toys I push around the wargames table while making "Brrrrm brrrm BOOM!" noises. However, it is not without its limitations. The major structural limitation lies in the fact that the strings of molten plastic can't be laid down in mid-air, and need some sort of support to lie on. 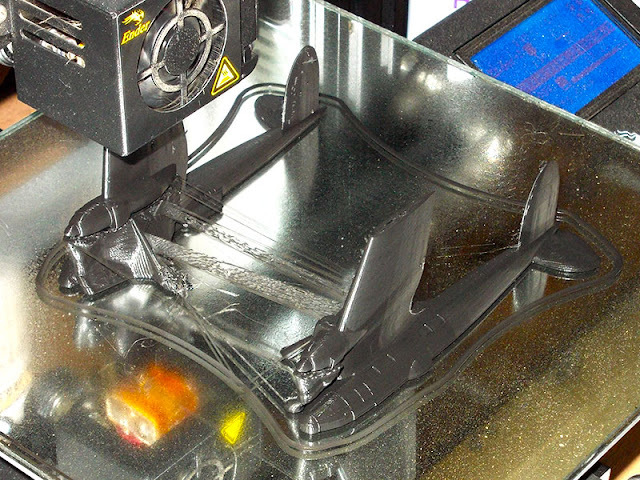 The printer can make its own supports as it goes along, and usually they do a pretty good job at supporting, but the bottom surfaces, lying on those supports, can be pretty ugly. Often enough, that doesn't matter too much for my purposes, because those surfaces will seldom be seen. 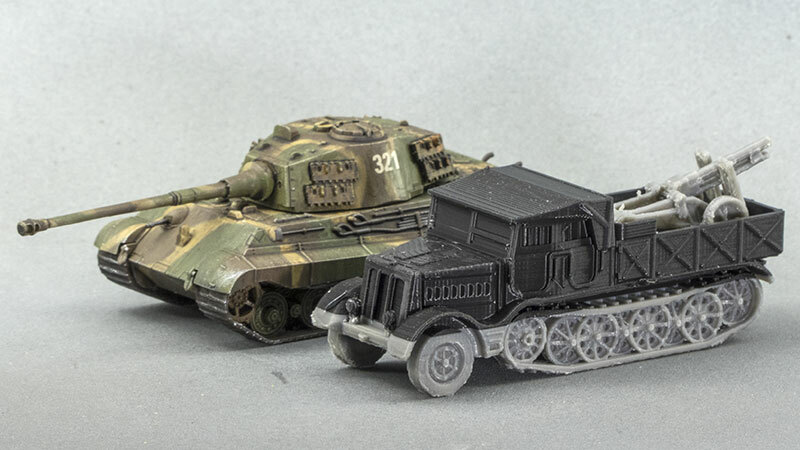 Shown here to the right is a 1:100 scale Toldi II which has been printed sitting on its tracks on the bed of the printer. The bottom of the hull, and beneath the turret where it was raised up above the print bed by the turret-plug, show the characteristically loose fibrous-looking surface you get over supports. It's ugly, but you never see it, so it doesn't really matter. 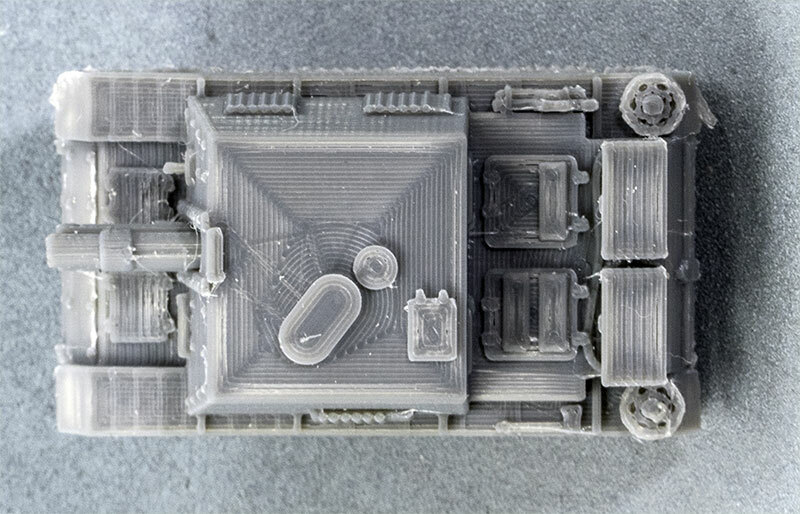 You can see that the bottom of the tracks, and the bottom of the turret plug, both of which were built up directly on the print bed, are much smoother. Although the bottom surfaces aren't usually visually important on these vehicle models, there is a situation where the imprecision of a supported surface can matter. That is at the meeting between the turret and hull. These two models (left) of the Vickers Light Mk.VIb were modeled differently. 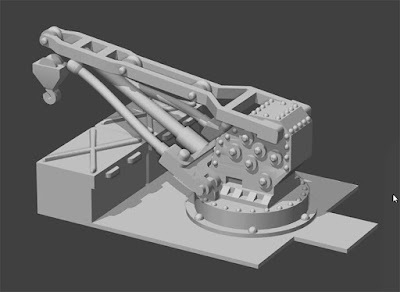 The one on the left had its turret printed in one piece, the same way as the Toldi II above, and you can see that the loose net-like structures left behind by the supports have somewhat rounded off the bottom edge of the turret, and they lift it away from the hull. 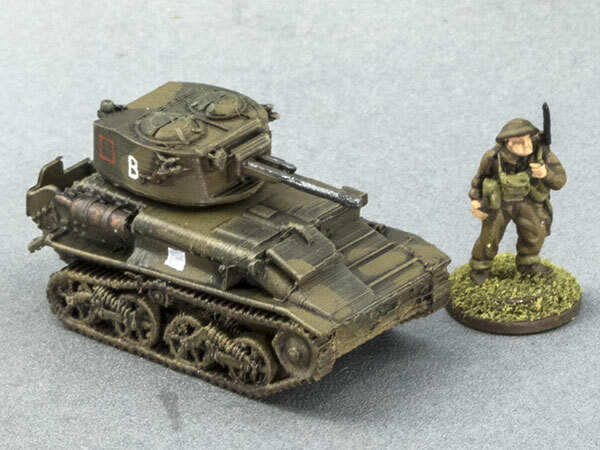 The model on the right had its turret printed in two pieces, as shown below, so that the bottom edge of the turret itself was built up directly on the printer's glass bed, giving a very smooth surface and a clean, sharp edge. It sits right down in contact with the hull top. The way I did this was to split up the turret into pieces. 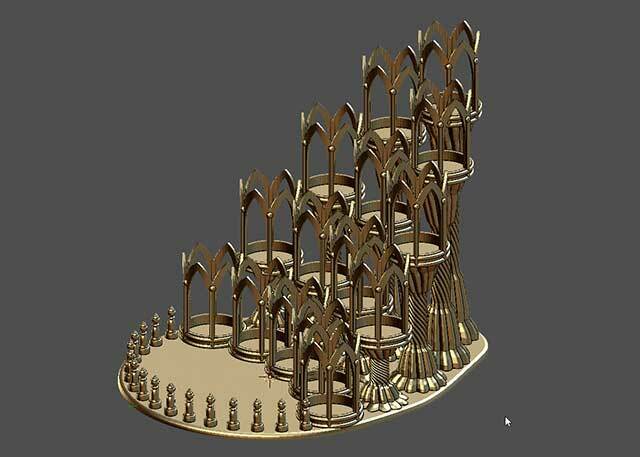 This picture (right) shows the whole model, laid out ready for printing. When I was cutting the turrets up, at the same time I punched a hole through the turret plug, with a matching one in the bottom of the turret itself. The small cylinders you see here are used as locating pins, to ensure that the pieces get glued together accurately. I also use the hole in the turret plug to house a 3x3mm cylindrical magnet, with a matching hole and magnet in the hull. The magnets are there to allow the turret to rotate freely without falling out and bouncing away under some furniture where it would never be found again. You will observe that the hull is printed standing up on its tail. The reason for this is because this orientation is optimal for reducing visible layer lines on the vehicle's sloping panels, and it also gives me better, cleaner detail in the track run. 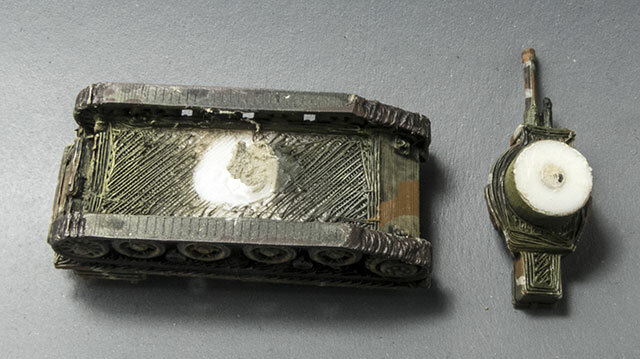 This turret for a British A10 cruiser tank (left) has been treated in the same way, except that the turret ring has also been detached from the turret and is printed along with the turret plug. This arrangement maximises the cleanliness of the edges where it matters, where it will be seen, while keeping the number of individual parts to a reasonable minimum. I could, if I so chose, split up the models into a multitude of component parts, each so arranged as to print to its best advantage. However, part of the appeal of a 3d printed model, for my purposes at any rate, is simplicity and speed of assembly. If I want to build a whole kitset model, I'll buy one. My aim is to find a happy medium between model quality and convenience, and this system achieves that for me. All of the base models I've used as examples in this post have been by m_bergman (Toldi II, Vickers Mk.VIb) and TigerAce1945 (A10). Their models are available on Thingiverse, and I highly recommend them both. This is a pair of 3d printed 1:100 scale British WWII A10 Cruisers, along with some 15mm Battlefront BEF figures in my sabot bases. The model is by m_bergman (or possibly TigerAce1945, I'm not 100% sure), very slightly modified by me. There are some definite issues with these prints: the side shields didn't print, I suspect because they were too thin, and I got a bit of warping on the turret base, a problem I haven't had to deal with for months. Also, on one of them there is a slight layer shift with associated under-extrusion, and what might have caused that I don't yet know. However, neither of them is so poor that it needs to be binned, and they'll do fine on the wargames table. I am going to have to do a bit of tinkering with my printer though, to get it back to printing properly again. Blender 2.80 is now officially in beta. From various bits and pieces I've seen about it on Youtube, it looks as though many of the UI and UX changes will be pretty good in the long run, but they're so extensive that I'm now pretty much completely lost in it. I no longer seem to be able to set specific values for things like extrusions, bevels, and so forth nearly as easily, as they're no longer immediately accessible on the toolbar. And when I've tried to do so via the pop-up gizmo, the measurement values appear to default to metres, in spite of the fact that I've set them to millimetres in the global settings. These are just a couple of the UI issues I've encountered in just a short time of playing with 2.80. I'll be keeping an eye on it, and I'll have to learn my way around the new UI eventually, but for the moment the changes are such that they've made my modeling life harder and less precise, rather than the other way around. I'll be sticking with 2.79 for quite a while yet, I think.